Evident in current Chinese government policy is the concept of the Chinese Dream. First announced by Xi Jinping in late 2012, the Chinese Dream is a predominantly economic vision, seeking to modernize China. It aims to create a ‘moderately prosperous society‘ by 2021 when the Communist Party of China (CPC) celebrates its centenary and to create a ‘strong, prosperous, and harmonious‘ state by 2049 when the People’s Republic of China (PRC) marks its centenary. There is however a military component to the Chinese Dream. The reforms being pushed by President Xi Jinping call for the modernisation of the People’s Liberation Army (PLA) to incorporate high-end air, sea, and cyber warfare capabilities. Domestically Xi Jinping has sought to tighten the grip of CPC’s political hierarchy over the PLA. Internationally, Xi has tasked China’s armed forces with securing significant land and maritime boundaries. The modernisation of the PLA represents one of the great geopolitical trends of our time. China’s renovated naval, cyber, and ballistic war-fighting capabilities aim to deny the East, South, and Yellow seas to the United States Navy, a strategy based on asymmetric warfare known as Anti-Access Area Denial (A2/AD). PLAN is investing heavily in subsurface combatants, estimating a fleet size of 80 submarines by 2020. The presence of a new generation of nuclear submarines, specifically the Shang-class (Type 093), will represent a direct threat to any US Navy vessel operating in the regional seas of the First and Second Island Chains. Compounding these concerns are China’s 100,000 sea mines. PLAN strategists have drawn attention to capability gaps in the US Navy’s mine defence. In a hypothetical conflict situation, China would be able to deny the East, Yellow, and South China Seas to US Pacific Command ships by detonating thousands of modern sea mines and torpedoes while using its significant submarine force to hamper movement. Beijing is also investing heavily in the cyber and space domains on which the United States military is heavily reliant. In 2007 China tested an anti-satellite weapon and is believed to be developing further such weapons that would cripple the ability of the United States’ to direct its naval forces. China is also expected to complete the Beidou satellite network by 2020, a system comparable to the United States Global Positioning System (GPS). The Beidou satellite network will aid the PLA in coordinating its air and sea forces. Most importantly, the PLA has embraced cyber warfare, fostering ‘cyber militias’ made up of hundreds of thousands of graduates turned hackers. While predominately used in industrial espionage, during conflict the PLA could employ cyber militias to overwhelm and blind digital infrastructure in the United States. Finally, with an eye on the United States’ aircraft carriers themselves, the People’s Liberation Army has invested heavily in ballistic missile technology. Termed the ‘carrier killer’, the DF-21 ballistic missile has a range of 1,700 kilometres and descends from so high that, in theory, it would defeat conventional carrier defences. Key details surrounding the technology remain unknown; the accuracy required to hit 100,000 ton Nimitz class in the vast expanse of the Pacific Ocean requires a high degree of sophisticated networking with orbiting satellites. Nevertheless, the development of the DF-21 and the DF-26 ‘Guam killer’ which ranges 3000 kilometres (threatening key bases throughout the Western Pacific), has worried Washington enough to begin refitting Arleigh-Burke class destroyers with anti-ballistic missile (ABM) technology. With ballistic missiles alone, China may already have the means to prevent US strike groups from accessing the First and Second Island Chains. Even with these A2/AD capabilities, it is highly unlikely that China plans to wage a war against its largest trading partner, the United States. 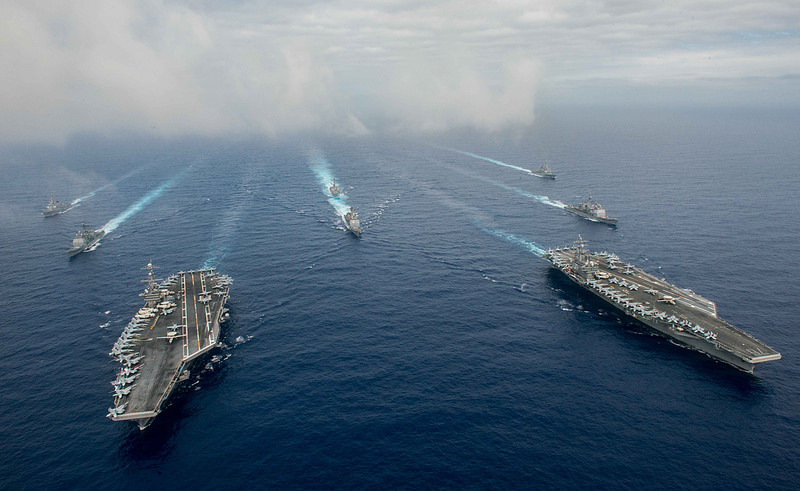 A2/AD is designed to deter opposing forces and allow China to establish a perimeter along the First and Second Island Chains that US carrier strike groups are unlikely to breach. As Sun Tzu said, “the supreme art of war is to subdue the enemy without fighting”. China’s leadership began speaking of a ‘period of strategic opportunity’ beginning in the 1990s and running to 2020. This period has allowed China to accumulate economic, diplomatic, and military power without drawing attention from key regional powers, specifically Japan and the United States. The concern is that after 2020, China will have grown strong enough to draw increased attention from Washington as its hegemonic position declines relative to Beijing. The overriding fear in Beijing remains containment by the United States, and the pivot under the Obama Administration confirmed China’s concerns that its rise would prompt the United States to reinforce its position in Asia. China’s A2/AD doctrine does not seem like a deliberate plan to force the United States out of the Pacific, indeed Beijing might quietly admit it has prospered under the US’ stewardship of trade and security ties in Asia. Instead A2/AD is a strategic hedge to secure Beijing’s position within Asia post-2020, counter balancing Washington’s system of alliances with Japan, South Korea, the Philippines, Singapore, and Australia. It is important to note that despite China’s military rise, the security architecture of the Asia-Pacific lies very much in Washington’s favour. With Beijing expecting the post-2020 security environment to be less conducive to its interests, A2/AD is China’s asymmetric insurance policy. Whether Washington sees it that way, is another matter entirely. Photo: The Nimitz-class aircraft carriers USS John C. Stennis (CVN 74), left, and USS Ronald Reagan (CVN 76) conduct dual aircraft carrier strike group operations in the U.S. 7th Fleet area of operations in support of security and stability in the Indo-Asia-Pacific. The operations mark the U.S. Navy’s continued presence throughout the area of responsibility. Philippine Sea (2016), by Jake Greenberg via Official US Navy Page on Flickr. Licensed under CC 2.0.